The so-called iPad Wi–Fi + 4G does not support any 4G network outside of North America. I did not remember reading anything about incompatibility with 4G networks in Europe when I purchased my iPad, so I went back to the Swiss online Apple Store page to see what was written there. Figure 1. 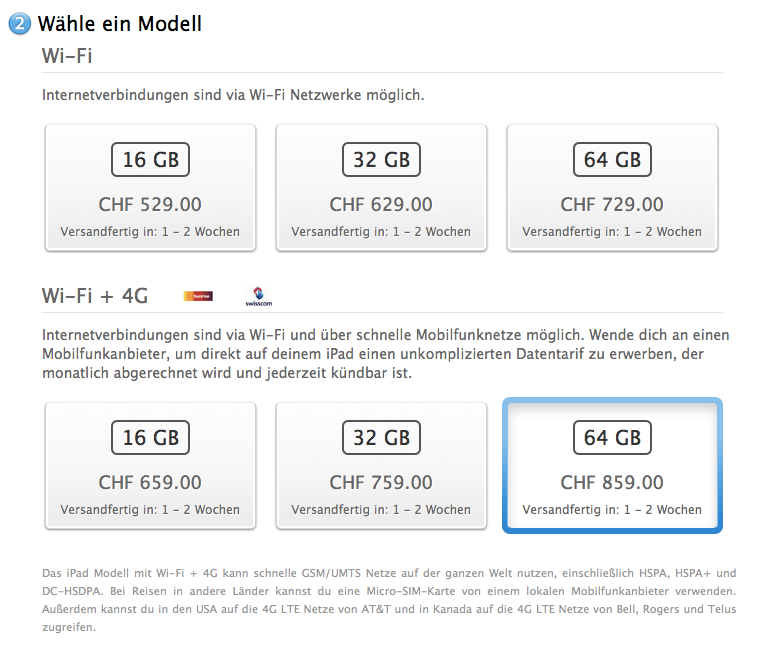 Selecting an iPad model on the Swiss online Apple Store. Two types of iPad are listed: Wi–Fi and Wi–Fi + 4G. Next to the heading Wi–Fi + 4G are the logos of two of the mobile telephone carriers in Switzerland: Sunrise and Swisscom. Swisscom has been testing 4G networks in several locations across the country. I chose the Wi–Fi + 4G model specifically because I hoped to take advantage of Swisscom’s 4G network as deployment progressed beyond the testing phase. The low-contrast, difficult-to-read fine print in gray explains that the device can be used only with HSPA, HSPA+ and DC-HSDPA networks. It mentions that the device can be used on 4G networks in the USA and Canada. However, the fine print does not clearly state that the Wi–Fi + 4G iPad cannot be used on 4G networks outside of North America. Swisscom’s web page again obfuscates the truth by repeating the misleading branding iPad Wi–Fi + 4G in large blue type, and indicating in the small print that the device will actually use HSPA+, not 4G. Most consumers probably do not know that HSPA+ is not true 4G, and Swisscom does not clearly state this. The actual maximum transfer rate of 42 Mbps is mentioned in the small print. Lower down on the same page though, Swisscom touts its 4G network, and even mentions speeds of up to 100 Mbps—this again despite the fact that the iPad cannot take advantage of this network. At the bottom of the page, the actual maximum transfer rate of 42 Mbps is mentioned again, along with an admission that the iPad is incompatible with European LTE (4G) networks. The text does not, however, clearly state that the iPad is incompatible with Swisscom’s 4G network. Further confusing matters are the additional details that appear if one clicks the Find out more button. 4G LTE is supported only on AT&T and Verizon networks in the US, and on Bell, Rogers and Telus networks in Canada. Yesterday, I called Apple and arranged to exchange my “Wi–Fi + 4G” iPad for the Wi–Fi–only model. The representative I spoke with was very helpful and understanding. He apologized for the confusion caused by the wording on the web page. When I asked if this was a common misunderstanding, he said that it was. He explained that many, many customers were now calling in to complain and to ask for refunds or exchanges. I am sure that the iPad 3 will be a big success for Apple, but this mistake will no only disappoint customers; it will also cut into the profitability of the product. It is misleading to brand the new iPad Wi–Fi + 4G outside of North America. Both Apple and carriers like Swisscom should update their marketing messages to be absolutely clear about the capabilities and limitations of the new iPad. Update 1, 2012.03.22 10:00 CET: The courier (TNT) picked up my “4G” iPad a few minutes ago. The replacement Wi–Fi iPad is backordered, and it looks like I will have to wait two more weeks before it will even ship. Considering that I already waited three weeks to receive the first iPad, it’s disappointing to have to wait again for the replacement. I know Apple is having trouble keeping up with demand. If many people are sending back their 4G iPads to exchange them for Wi–Fi models, this is surely putting an even greater strain on supplies. Update 2, 2012.03.22 15:00 CET: I went by to the Apple Store on Bahnhofstrasse this afternoon to see if I could obtain a replacement more quickly there. They had the so-called 4G model in stock, but were out of the Wi–Fi one. I may return tomorrow morning try my luck again. I prefer not to wait another three weeks. Update 3, 2012.03.22 17:45 CET: The iPad 3’s lack of support for 4G outside of North America is generating quite a bit of discussion online. Some carriers have opted to remove the “4G” from the branding entirely since the device does not support 4G in their region.